In 10-inch skillet, heat oil over medium heat. Cook onion and garlic in oil about 4 minutes, stirring occasionally, until onion is tender. Stir in spaghetti sauce, tomato sauce and Italian seasoning. Place 1 cup of the sauce mixture in bottom of 5- to 6-quart slow cooker. Add 1 package frozen ravioli; top with 1 cup of the cheese. 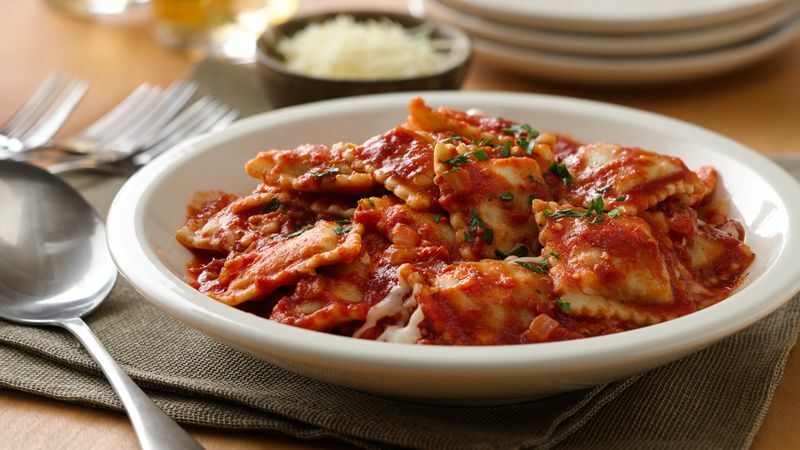 Top with remaining package of ravioli; top with remaining 1 cup cheese. Pour remaining sauce mixture over top. Cover and cook on low heat setting 5 to 7 hours or until ravioli are tender. Sprinkle with parsley. Serve with a loaf of crusty French bread and a tossed green salad. Italian seasoning is a blend of typical Italian herbs such as thyme, oregano, basil, savory, marjoram, rosemary and sage. Using this blend saves you from adding all these seasonings separately.